Published on March 9, 2016 by Martyn. Be the first to comment! 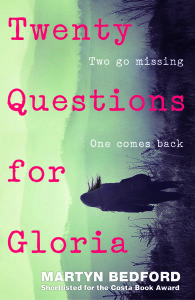 The virtual tour for Twenty Questions for Gloria has stopped off at two more prominent fiction sites. Q. How did you formulate your protagonists’ personalities (in TQFG)? Were they based on anyone you know? A. When I first started writing novels, I used to base my main characters quite closely on people I knew (or on myself, sometimes). But, with each book, I gained more confidence in moving away from reality and inventing characters from scratch. Gloria isn’t based on anyone. To an extent, I’ve drawn on my own memories of being a 15-year-old looking to escape on an adventure but, in terms of her personality, she isn’t much like my teenage self. As for Uman, I don’t know where he came from. Well, I do, of course – he came from my imagination. But how he got in there is beyond me! To read the rest, and to check out The Big Book Project site, please click on this link. Q. If you could live as a character from one of your books, who would you be and why? A. All of the main characters in my young-adult novels go through some pretty traumatic experiences, so I’m not sure I’d want to live as any of them! I suppose I’d most like to be Uman, in Twenty Questions for Gloria, because he’s witty, intelligent, (kind of) good looking, breaks all the rules and has a huge sense of adventure. During my Famous Five reading phase, I wanted to be Georgina (George) – so, I was a boy who wanted to be a girl who wanted to be a boy. In those days, you kept quiet about that kind of thing in the school playground. Again, to read the whole Q&A please click on this link – and do check out wordery.com while you’re there. It’s much, much more than just a book ordering site.